We’d love your help. Let us know what’s wrong with this preview of Mount Haven by Melanie P. Smith. Bailey’s on the When evil finds her, will the hunters become the prey? Bailey’s on the run. She landed in Mount Haven and fell in love with the peaceful little town immediately. She keeps to herself and reveals nothing, but her sharp mind and secretive nature have attracted the attention of the Cooper brothers. One is her new boss — the other the town sheriff, both are too perceptive. 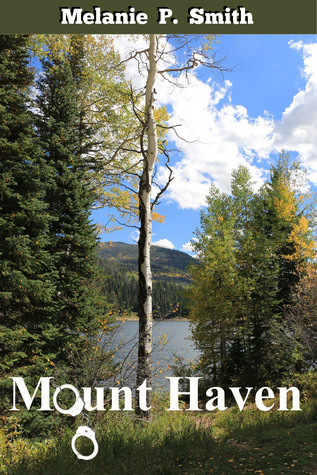 To ask other readers questions about Mount Haven, please sign up. I did not have to think twice about rating Mount Haven as five star. It is well deserved. At 441 pages it seemed lengthy but I can tell you that you are getting great value for money. As I read, the pages were turned/flicked continuously and I didn't notice how quickly I was getting through the ebook. It had everything I look for in a book, great storyline, characters, a dog and writing of a high standard. Characterisation and development was spot on. Rowdy is a great character, his life style an I did not have to think twice about rating Mount Haven as five star. It is well deserved. At 441 pages it seemed lengthy but I can tell you that you are getting great value for money. As I read, the pages were turned/flicked continuously and I didn't notice how quickly I was getting through the ebook. It had everything I look for in a book, great storyline, characters, a dog and writing of a high standard. Characterisation and development was spot on. Rowdy is a great character, his life style and choices and scenarios he finds himself in are all believable. Secondary characters are given the exact same treatment and details and mannerisms of each individual have been well thought out and planned. When I looked at the categories and saw 'Romance' I hesitated before clicking the buy button. I am dubious about this genre in books but the blurb did draw me in. I shouldn't have worried. The 'romance' wasn't what I imagined it to be even though it is in the sub-category. Melanie P Smith treated and wrote it so differently from other authors I have read. The love interest of Rowdy isn't predictable like most romances I have came across, the author's main character questions his own interest and feelings and makes the reader pause for thought - Example - It was better to not have her in the first place. So why did that feel so wrong? - This is excellent writing to draw the reading audience in and make them think. I shall be reading more from Melanie P Smith. I loved everything about this novel—the relationship between the two brothers being my favorite. Their banter is hilarious, and their love for each othe Mount Haven is a quiet town in Montana, and the perfect place for the Cooper brothers, Andy and Rowdy, to settle after Rowdy, the younger of the two, is seriously injured on the job. Little do they know that their quiet life wouldn’t stay quiet for long when two serial rapists/murders set their sights on the new manager of Rowdy’s bar and grill. This book is truly... addicting. I'm later treated to a great cast of brilliantly designed characters who are all not too far into the process of starting over in a small town, and whose paths cross or are... intermingled is more like it. It makes you think "everything happens for a reason" as things just ... coincide. We're also This book is truly... addicting. We're also treated to small town life - I absolutely love small towns and the quirky characters that tend to be involved - Mount Haven did not disappoint in this regard. There is suspense and there is romance - and I do not mean together. The budding romance is in the midst of some intense action. The reader is repeatedly treated to the POV of the deranged antagonists in this fun adventure - making it all the more juicy. I highly recommend this read - whatever genre you favor as it's got bits of many going on. I like a good police story. I've read most of Joseph Wambaugh's books and enjoy them very much, especially his earlier works. You can tell immediately he is very knowledgeable of the inner workings of police work, and it reflects in his writing. Recently I read Mount Haven by Melanie P Smith. The cover didn't shout police story but I was intrigued by a small icon of handcuffs in the title. What a pleasant surprise this book was. Mount Haven is a police story, a good police story, told by an auth I like a good police story. I've read most of Joseph Wambaugh's books and enjoy them very much, especially his earlier works. You can tell immediately he is very knowledgeable of the inner workings of police work, and it reflects in his writing. Recently I read Mount Haven by Melanie P Smith. The cover didn't shout police story but I was intrigued by a small icon of handcuffs in the title. What a pleasant surprise this book was. Mount Haven is a police story, a good police story, told by an author who obviously knows the subject matter. The book starts in high gear and doesn't let up anytime soon. I was immediately drawn into the story line and was kept wondering what was going to happen next. I felt like I was right there with the characters. A very good read. Hope to see more like this one from this author. The only thing to make retirement worse for a career cop, is to be compelled to retire through injury. In this tale of suspense, romance, action, and death, a remote town becomes the hub of a wide variety of relationships. The cast of characters includes the injured retiree, his serving brother and family, people hiding from their pasts, psychopaths, and a smattering of others, who all play a part in the interconnecting drama. Let us not forget the retired cop’s sidekick, Knight, an ex-cop K9. The The only thing to make retirement worse for a career cop, is to be compelled to retire through injury. In this tale of suspense, romance, action, and death, a remote town becomes the hub of a wide variety of relationships. The various aspects of the tale are cleverly interwoven to maintain a steady pace and hold the reader’s interest. If you like to be taken on a rollercoaster journey with a wide variety of well-developed characters, including the bad guys, then this story is for you. Mount Haven was one of my favorite books so far. I love the novel and hope you will do more of these types of cop novels. I do not have very much time to read at all, but when I do there is nothing like a good paperback book. I was hooked as soon as I started reading it and finished it on my recent camping trip. I love this novel and your dedication page so keep this series going Melanie.